Ringostation is a website where you can get ringtones and wallpapers from. It’s a huge collection of all kinds of ringtones. You have to join in order to get those high quality ringtones and beautiful wallpapers. 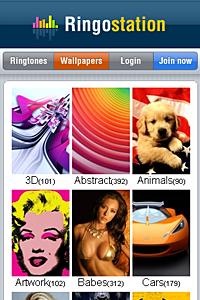 The site is being updated daily and already has over 750,000 iPhone ringtones and more then 10,000 wallpapers. There’s a search option to find certain ringtones very easily. The same goes for wallpapers. In over more then 20 categories, like Cars, Movies and Animals, you have a enormous amount of wallpapers always on your iPhone. There’s now a big selection of Christmas ringtones. Via the following link, http://www.ringostation.com/search/song/christmas/, you can see this nice list. You can download ringtones like Mariah Carry’s famous ‘All I Want For Christmas Is You’. Or maybe you want ‘Blue Christmas’ from Elvis Presley. The choice is yours, the choice is huge. 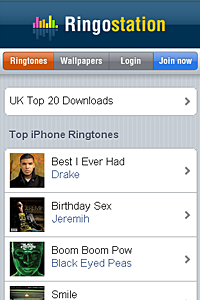 Or do you want the most popular ringtones at the moment? Via this link, http://www.ringostation.com/Jay_Z/tones/Empire_State_Of_Mind_(Feat._Alicia_Keys)/, you go to Jay Z’s ringtone ‘Empire State Of Mind’ and via this link, http://www.ringostation.com/50_Cent/tones/Baby_By_Me_(Feat._Ne-Yo)/ you go to 50 Cent’s ringtone ‘Baby By Me’. It’s best to visit the site with the iPhone. Ringtones and wallpapers will be downloaded directly onto the device. So what are you waiting for go to the website and have fun picking your Christmas ringtone or wallpapers in the Games category. One bit of information you forgot to mention: all ringtones on this site are paid. You need to subscribe and pay with your credit card. I don’t really know what the risk is of being caught with copied songs on your phone but at least by buying them you get peace of mind, so long as they are legit in the first place.